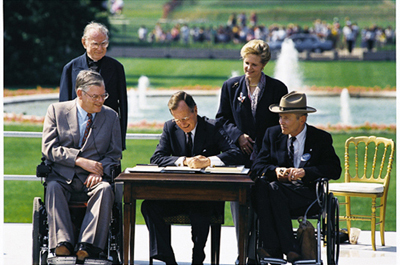 Federal and state legislation like the Disabilities Act of 1990 raised consciousness about handicapped citizens. It also prompted research and development of disabled-accessible construction technology products like the talking thermostat. Thats one of the advantages of our capitalist economic system, love it or hate it; the demand for improved goods precedes innovation, and this generally improves our lives. Truly successful architects, engineers, remodeling contractors, and interior decorators stay ahead of the curve and educate themselves. If you are considering remodeling a home that you or other challenged people occupy, its important to do your homework and learn what aids are available; more are being introduced all the time. One of the most impressive thermostats on the market for the blind and visual-impaired is the Kelvin Voice Activated Talking Programmable Thermostat . After someone invented the Clap On, Clap Off light switch, this development was inevitable. This thermostat is both programmable and voice-interactive. Push the control buttons makes it describes the buttons function verbally. Then the user tells the thermostat what setting to use. Done. Another product is called the Easy To See Thermostat. This innovative device resembles the typical round-shaped model found in many homes except it features tactile raised numbers. It also makes a clicking noise when the user turns the setting dial. Bathroom grab bars and handrails are the most common of these bathroom fixtures. Thesere very important for the safety of mobility-impaired people entering and exiting the bath as well as sitting down or getting up from the commode. During a bathroom remodeling project, you must install wood backing between the wall studs to secure these devices. There are also sinks available that are designed to be 27 to 30 off the floor. This allows the wheelchair-bound to get as close as possible. There are also sinks on the market up to 40 high to aid residents who have trouble bending or leaning over. Roll-in showers and walk-in bathtubs are becoming more popular for people with mobility challenges. A remodeling contractor or licensed plumber can install one as a quick project. Your kitchen is an important area of your home for outfitting. Countertops and sinks have special height considerations. They should be adjusted height-wise and also allow enough overhang for wheelchair users. Note also that very short people have these same considerations. Something else to consider for wheelchair users is mounting fog-free mirrors over your working surfaces as well as your stove. This will allow you to view things while avoiding pushing up out of the chair. Ramps will almost always need to be custom-built on your site. Why? Because your existing situation is likely to be so unique that Home Depot isnt going to stock them. On the other hand, wheelchair lifts are commercially available for a wide variety of situations. For example, porch lifts are basically exterior elevators. These can be an ideal solution for houses built on stilts. Then we have stair lifts. These are chairs that run up and down your staircase on a rail. If you have a swimming pool, pool and spa lifts are available to move someone in and out of the water. The moral of the story is that just because someone is handicapped or disabled doesnt mean they must give up independent living. Today, it is easier than ever before because of the array of constantly evolving products.